Poodles have been around for thousands of years, and the poodle history is plenty. Art lovers will recognize them in many drawings and paintings from the 15th and 16th centuries. They started out as water dogs and retrieved water fowl for hunters. Their webbed feet and water resistant coat made it popular for being a water carrier. Although the exact origins of the dog are unclear, poodle history points to them originating in Europe, perhaps with Germany, Belgium or Holland being the original country of their existence. 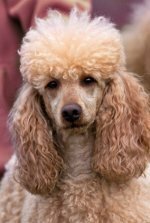 They are called "French poodles" as they became very popular in France around the 18th century where French royalty, elite and aristocrats brought them into their homes. 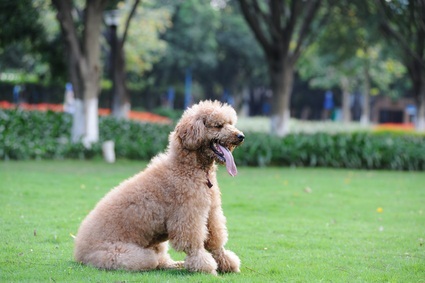 Out of the three sizes of poodles - the toy, miniature and standard, the standard is the oldest member of the breed. France is noted for introducing the smaller breeds - the toys and miniatures. Poodles were popular circus performers. With their love of fun, their ability to learn quickly and their high intelligence, they were the perfect dog to learn and perform tricks. The French starred them in their shows in the 1700's, where they were dressed in bright, fancy costumes to perform their tricks. Because of starring in circus shows and being companions of wealthy French elite, they started getting a reputation as a performing dog and a dog for high society members. The dog's unique grooming style and appearance can be traced to its days as a working water dog. Their dense coats sometimes made walking difficult for them when they were wet. Groomers began grooming the hindquarters and legs while leaving the chest area fluffy and curly to give the animal warmth. Ribbons were put in the dogs' top head of hair to help keep the hair out of their eyes and also to help their owner's recognize them from other poodles or to help their owners see them when they were swimming or outdoors alone. Our beloved United States dogs came to our country in the late 1800's and became popular in the 1930's. These early dogs came to us directly from England. Today, we have toy, standard and miniature poodle breeders. Today, you can rescue standard poodle puppies, help with a toy poodle rescue, or form a rescue group in your city. The 21st century poodle is still retrieving and is winning ribbons in various shows around the country. 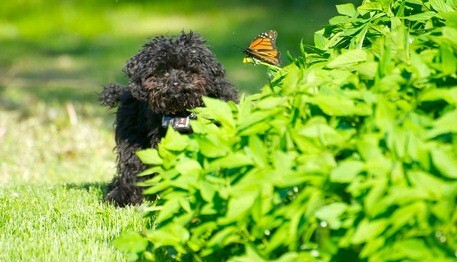 The poodle is also a very loving, fun and devoted pet to the lucky family that is proud to own her.